Sauerbraten, schnitzel, brathahnchen, knockwurst and oompah-pa are far from the normal fare at Okinawa festivals, but they’ll all be part of this weekend’s Oktoberfest at Camp Foster. 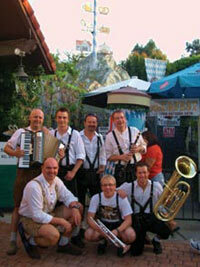 A special German Buffet Friday evening at the Butler Officers’ Club kicks off Oktoberfest celebrations, complete with the Original Klaustaler Musikanten, a renowned oompa-pa band pumping out traditional festive beer drinking music. After all, Germany’s Oktoberfest is the granddaddy of all festivals, 16 days of Gemutlichkeit, fun and of course, beer, in the Bavarian city of Munich. This year, 6.2 million people flocked to Munich to participate in the world’s largest bier party. Oktoberfest moves outdoors Saturday and Sunday to the Camp Foster Parade Deck, where dozens of foods and game booths will locate, together with amusement rides and a Kiddie Land. Foods will be multi-cultural, but there’s plenty of authentic German food to be had. The event is open to everyone, island-wide, and admission is free. Oktoberfest runs 3~10 p.m. Saturday, and 1~10 p.m. Sunday. No pets, bottles, outside alcohol or coolers will be allowed on the festival grounds. The Original Klaustaler Musikanten will perform over the weekend, along with In Heat, Floyd Van Laningham, Tim Watson, and SubFive. The Pacific Okinawan Players (POP) will make special guest appearances both days. A Truckload of Fun giveaway takes place on Saturday, according to Marine Corps Community Services organizers, and there will be opportunities to win round trip tickets or seating class upgrades to any United Air Lines gateway city, courtesy of United and Omega World Travel. The giveaways start at 3 p.m. Saturday. Additional prizes will be up for grabs during stage appearances. Butler Officers’ Club is taking Oktoberfest to new heights this year with something unique. A German Buffet will be featured Friday evening, including Sauerbraten (marinated beef), Bavarian Schnitzel (breaded pork cutlets), Bayerische Brathahnchen (Rotisserie chicken), Schweinebraten (pork steamship), knockwurst and bratwurst with sautéed onions, and Panierter Fisch with sauce tartar (fried Pollack with tartar sauce). Tickets for the buffet are $35. Transportation from bases to the Butler Officers’ Club is provided. Buses pick up passengers at Camp Kinser’s Surfside Club and Camp Courtney Courtney Bowl at 5 p.m., from MC-T School at 5:15 p.m., and from Kadena USO and Camp Foster Old Gunner’s Gym/Lemon Lot at 5:30 p.m. Return routes to bases begin at 10 p.m.